Recently, Best Buy sent me Google ChromecastAudio products to review and check out in my regular routine. Let me just say that this method of Improving My Workflow was amazing. You see, I am all about some great music. In fact, music is one of my favorite parts of life. I need the motivation some days, and others I need a little bit of soothing sound. That means my office has to have some music going for me to focus. Yes, I am one of those people that need the background noise to focus. So, reviewing this set of Google Chromecast Audio Products was a perfect fit. Working from home has some major challenges. Especially, when you have a 9-year-old son around who is being homeschooled at the same time. Some days, I feel like I haven’t gotten a single thing done all day because I keep going in circles. So, any tips for improving my workflow are a must. That’s why this was a great fit for me. 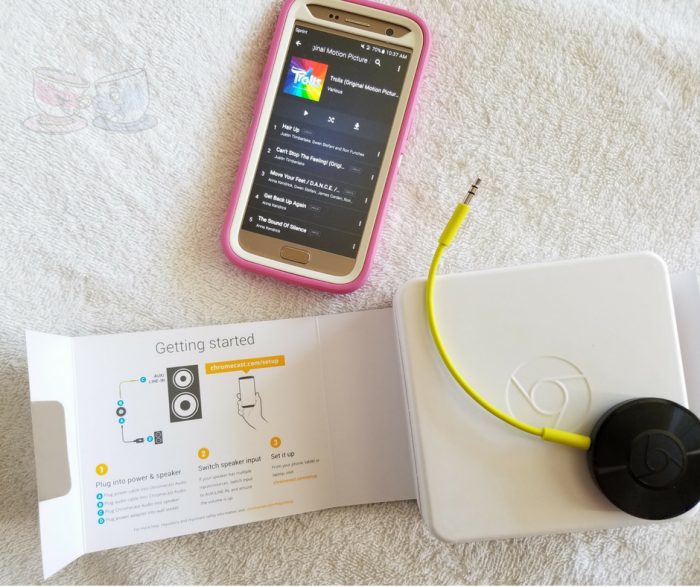 I knew I could share some of my top workflow tips, while also giving my honest opinion about the Google Chromecast Audio products. My day starts off with some great music. I need this to put me in a good mood, and to, often times, wake up. Lately, this has been the Trolls Motion Picture Soundtrack. In the past, it has been Justin Timberlake, Elton John, or even a bit of Jefferson Airplane. My music tastes are just as eclectic as I am. All that really matters is that the sounds are great, and in the mornings, they are uplifting. I start my day off with coffee and breakfast, but before I even get out of bed, I have music going. Google Chromecast Audio makes it easy for me to pick up my phone, log into my music streaming accounts, and hit a button to have it played throughout my home. When our home is done with renovations, that means I can set my music to play in my bedroom while I get ready for the day, and also have it streaming downstairs to alert the Wee Child that it’s time to get started for the day. Listen via your favorite apps on your speakers throughout your home. No longer tied down to your phone, app, and earbuds. Okay, one of my biggest workflow improvements has been to prep my breakfasts items in advance so I can have coffee and a low SmartPoint breakfast in minutes every morning. This has included making sure the coffee pot is ready the night before to simply hit the on button. It also includes portion controlling things like breakfast muffins, fruit, and my favorite turkey sausage so all I have to do is grab a bag from the refrigerator and reheat or sit down to eat. A small time investment on the weekend can make breakfast easy to manage. I use the same meal prep tips I shared for weeknights for my breakfasts. Any prepping I can do ahead of time makes it so much easier to manage. A good start to the morning vastly improves my workflow. Frankly, getting to bed at a decent time has made a much bigger difference than I ever imagined. Since my Beau went back to work outside the home this winter, we have been working on consistent bedtimes. He has a commute each day which means he is up and out the door fairly early. By going to bed early with him each night, I am able to get up refreshed and focused in the mornings. I find myself able to get started and hit play on my music by 8 am every morning consistently now. This may not seem like much for most, but considering the crazy hours I have kept in the past, this is a big deal for me. The best thing you can do to improve your workflow is to eliminate distractions and frustrations that cause problems. While some would say music is a distraction, it isn’t for me. However, I have to turn off social media, my phone, and often will tell my Beau or the Wee Child that I need a few hours alone to work. Take notes on good and bad days and compare the differences to figure out what is causing you the most frustration. Remove those things and refocus for better workflow. 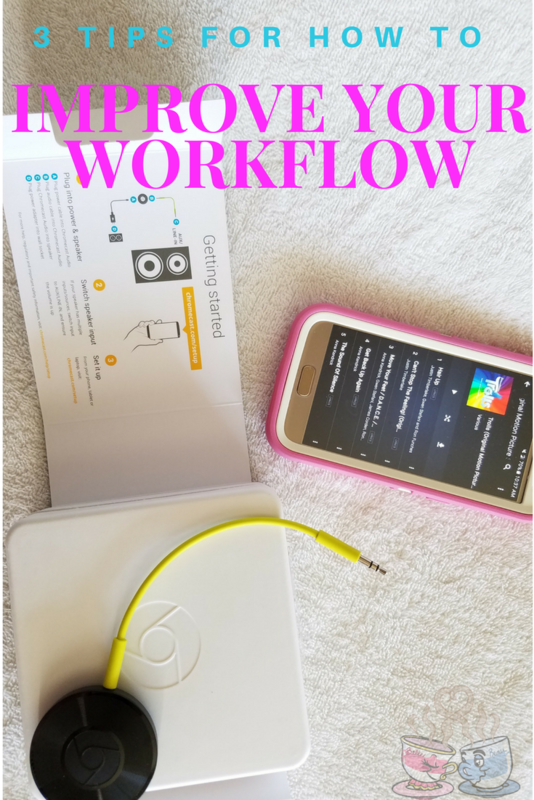 As you work to improve workflow in your home business routine, don’t forget to grab the Google Chromecast Audio products to help make streaming music or podcasts throughout the day easy to manage no matter where you are in your home.